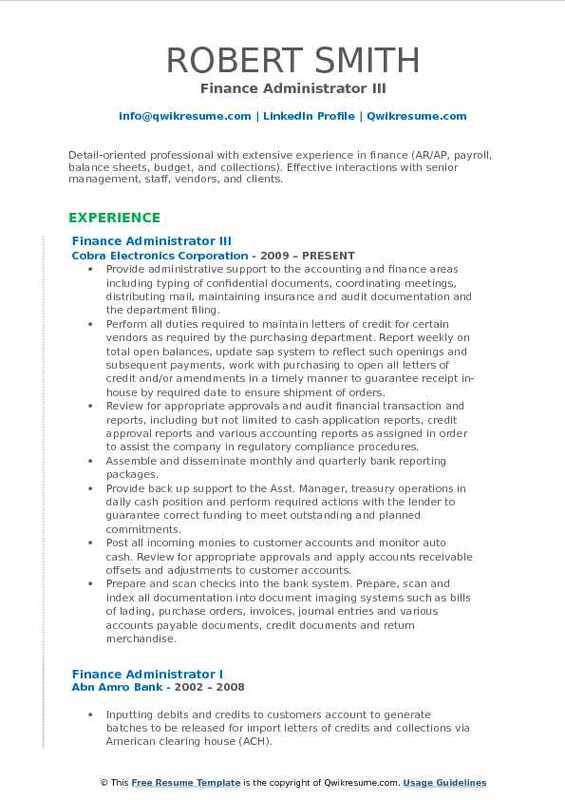 The Finance Administrator is responsible for job tasks, like managing financial-related tasks in the company. 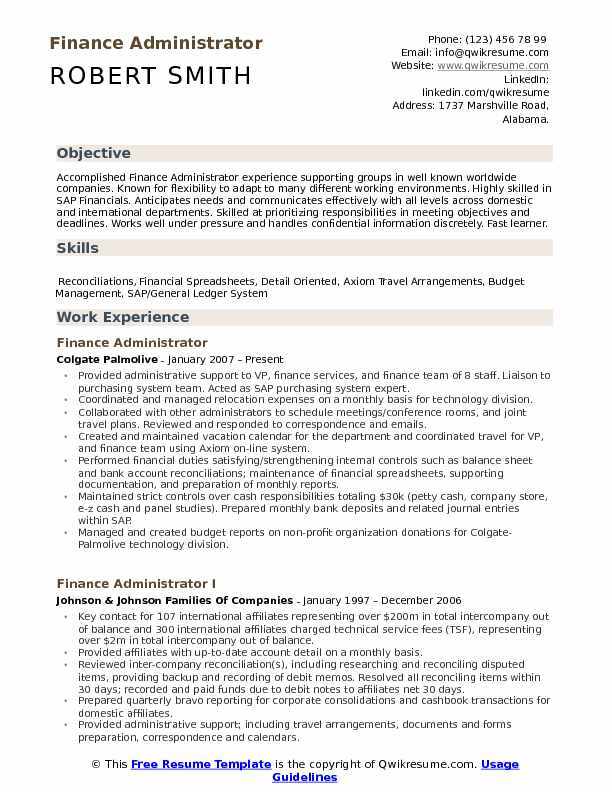 Some of the other important job duties that can be commonly seen on a Finance Administrator Resume are: manage payroll transactions, maintain financial records, manage tax-related information, maintain separate accounts for funding, charity, etc. To embark on this challenging career, you need to have certain important and mandatory qualifications and characteristics, like strong mathematical skills, flair for finance and taxing, excellent decision-making skills, prudent budgeting abilities, documentation and reporting skills, exceptional knowledge in the financial and economic status of the country as well the company, a knack for being up to date with current financial news and trends, etc. The minimum education required to apply for this role is a Bachelor’s Degree in domains like Finance, Commerce, etc. Special preference will be given to people with relevant work experience, Master’s Degree or Specialization in the relevant field. Summary : Accomplished Finance Administrator experience supporting groups in well known worldwide companies. Known for flexibility to adapt to many different working environments. Highly skilled in SAP Financials. Anticipates needs and communicates effectively with all levels across domestic and international departments. Skilled at prioritizing responsibilities in meeting objectives and deadlines. Works well under pressure and handles confidential information discretely. Fast learner. Provided administrative support to VP, finance services, and finance team of 8 staff. Liaison to purchasing system team. Acted as SAP purchasing system expert. Coordinated and managed relocation expenses on a monthly basis for technology division. Collaborated with other administrators to schedule meetings/conference rooms, and joint travel plans. Reviewed and responded to correspondence and emails. Created and maintained vacation calendar for the department and coordinated travel for VP, and finance team using Axiom on-line system. Performed financial duties satisfying/strengthening internal controls such as balance sheet and bank account reconciliations; maintenance of financial spreadsheets, supporting documentation, and preparation of monthly reports. Maintained strict controls over cash responsibilities totaling $30k (petty cash, company store, e-z cash and panel studies). Prepared monthly bank deposits and related journal entries within SAP. Managed and created budget reports on non-profit organization donations for Colgate-Palmolive technology division. Managed $1m budget for technology innovation fund. Prepared 1 to 5-year trend report and presented to the president of the technology division. Ensured the efficient operation of daily activities requiring discretion, excellent business judgment and sound decision making. Concurrent roles split 60% time on finance; 40% time on health services administration. 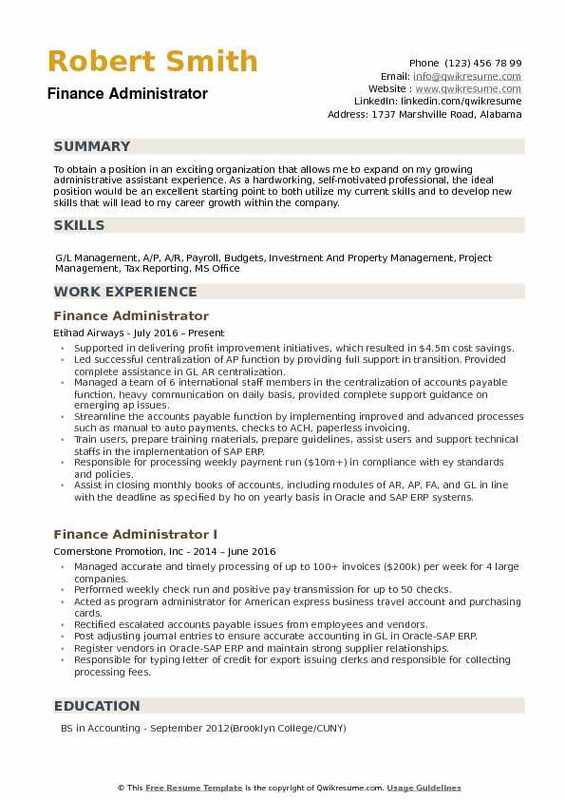 Summary : Finance Administrator with over 7 years of administrative experience looking to get back in the office world. Exceptional experience in providing administrative support and customer service, managing records, and handling time and attendance. Good communications skills, effective in meeting customers requests, responsive and task-oriented, organized, hardworking and dependable in meeting deadlines. Provides comprehensive financial management and accounting support for the department of urology including the preparation and development of budgets, profit and loss statements, variance reports, business, and physician. Develops the departments 25 million dollars annual budget inclusive of the hospital, practice plan, and grant budgets and presents to the department. Prepares monthly journal entries, allocating practice expenses, to the clinical faculty accounts, including salary allocations for support staff using the ARC. Implements and monitors budgets, including preparing variance reports and explanations. Identifies potential overdrafts and apprises the department administrator of the budget impact. Creates management reports to enable the department to maximize revenue. Evaluate physician productivity and identify financial results by specialty and by service. Evaluates existing departmental programs and satellite processes to determine profitability. Develops business plans and recruitment plans for new programs and physicians. Summary : Bookkeeping professional with experience in accounting and operations management. History of achievement and innovation coupled with outstanding work ethic, commitment, and loyalty. Proven track record of leadership and ability to thrive in a team environment. Seeking new challenges within a dynamic, growing organization. Responsible for data entry of all accounts payable and receivable transactions. Monthly reconciliation of all DRA bank and general appropriation accounts. Approve payments of all grant program requests for reimbursement and administrative expenditures. Communicate with all internal departments, external vendors, and financial institutions to resolve problems and conduct day to day operations in a professional and courteous manner. Participate in the preparation, evaluation, justification, and maintenance of budgets and budgetary controls. Prepare a variety of detailed accounting and narrative financial statements or ad hoc reports requiring analysis and interpretation. Assist in developing and carrying out personnel policy decisions outlined in the personnel manual. Provide limited human resource management to all DRA employees to include policy and procedural training for new employees and monitor employee personnel and attendance paperwork. Process travel reimbursement request per dra travel guidelines and provides monthly employee travel audit report. 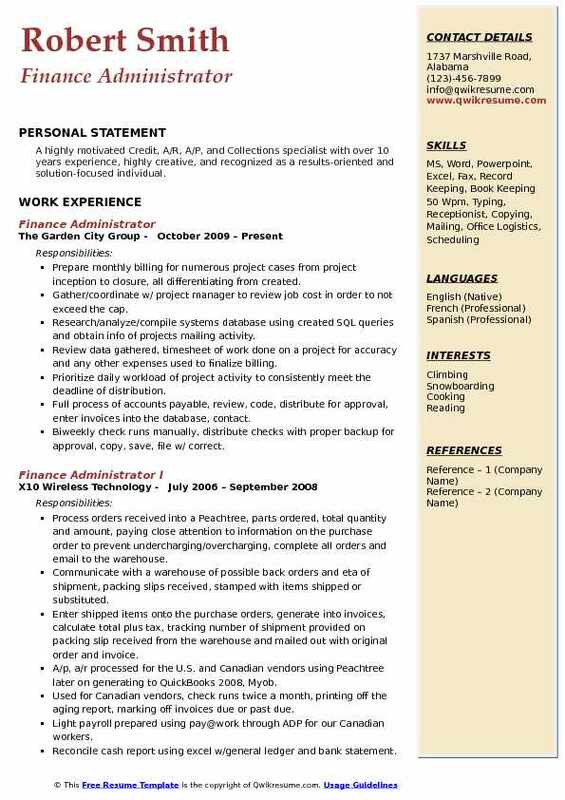 Summary : Detail-oriented professional with extensive experience in finance (AR/AP, payroll, balance sheets, budget, and collections). Effective interactions with senior management, staff, vendors, and clients. 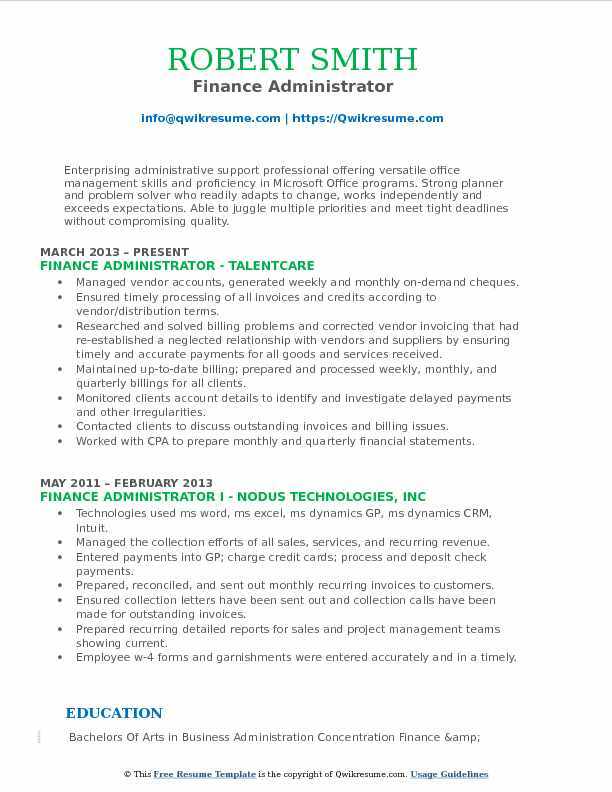 Skills : Microsoft Office, Accounts Payable, Accounts Receivable, Purchasing, Reconciliation, Accounting, Microsoft Excel, Microsoft Word, Peachtree, Spreadsheets, Quickbooks, Billing. Provide administrative support to the accounting and finance areas including typing of confidential documents, coordinating meetings, distributing mail, maintaining insurance and audit documentation and the department filing. Perform all duties required to maintain letters of credit for certain vendors as required by the purchasing department. Report weekly on total open balances, update sap system to reflect such openings and subsequent payments, work with purchasing to open all letters of credit and/or amendments in a timely manner to guarantee receipt in-house by required date to ensure shipment of orders. Review for appropriate approvals and audit financial transaction and reports, including but not limited to cash application reports, credit approval reports and various accounting reports as assigned in order to assist the company in regulatory compliance procedures. Assemble and disseminate monthly and quarterly bank reporting packages. Provide back up support to the Asst. Manager, treasury operations in daily cash position and perform required actions with the lender to guarantee correct funding to meet outstanding and planned commitments. Post all incoming monies to customer accounts and monitor auto cash. Review for appropriate approvals and apply accounts receivable offsets and adjustments to customer accounts. Prepare and scan checks into the bank system. Prepare, scan and index all documentation into document imaging systems such as bills of lading, purchase orders, invoices, journal entries and various accounts payable documents, credit documents and return merchandise. Develop policies and procedures fostering positive banking relationships and cash management. Implemented a current document imaging system, increasing company cost-effectiveness efficiency. 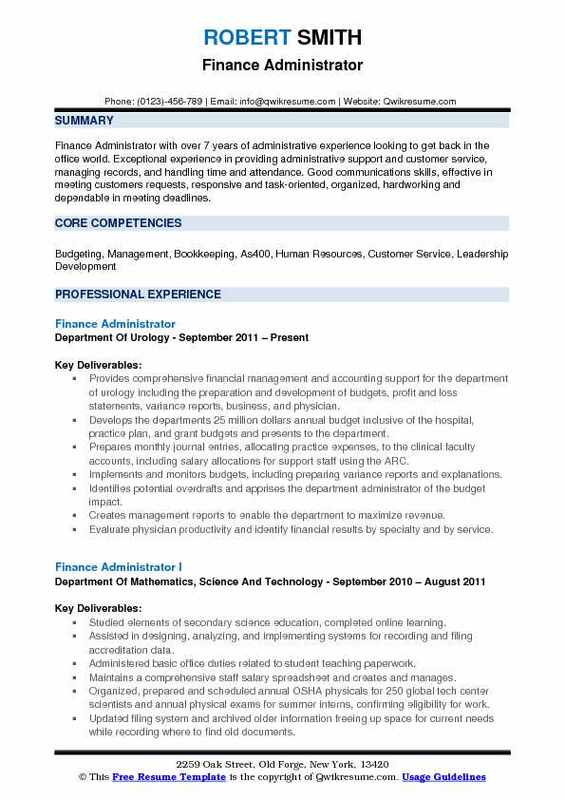 Objective : Accomplished and energetic Finance Administrator with a solid history of achievement in Finance/HR. Motivated leader with strong organizational and prioritization abilities. Areas of expertise include Payroll, Accounts Payable, Accounts Receivable and Human Resources. 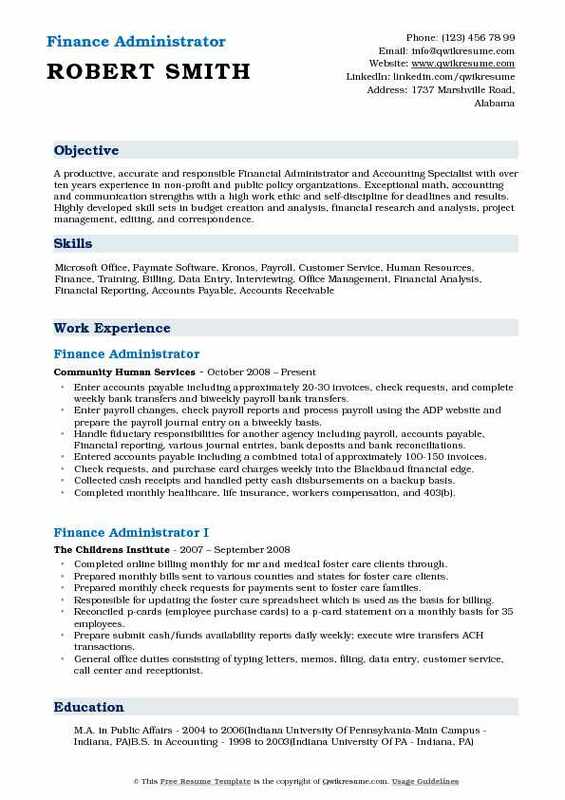 Supported the finance manager - administrative duties included filing, copying, scanning, maintaining payroll and costing records, and preparing the monthly energy report. Keyed time entry weekly for 100 associates into SAP and performed audit for verification. Created a payroll report in excel with graphs and charts for support for the plant manager to track hours used and trending. Created reports utilizing MSBI at the top level and subaccounts for weekly/monthly management reports. Produced a detailed weekly target cost report utilized to measure plant spending, inventory, and price variances. Utilized data from sap and adding it to individual reports to build pivot tables, charts, graphs, and trends – ad-hoc for various plant management. Created material costs, built BOM’s, added routes and production versions for supply chain production. Reviewed route and material lists to update the plant manager for necessary changes. Created a workbook in excel to utilize raw data and pivot tables for categories/material types for use variance report. 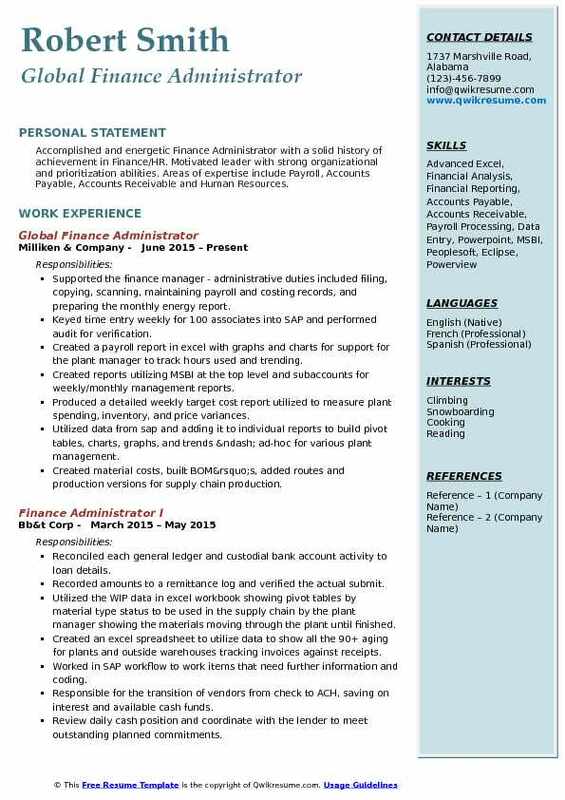 Summary : A productive, accurate and responsible Financial Administrator and Accounting Specialist with over ten years experience in non-profit and public policy organizations. Exceptional math, accounting and communication strengths with a high work ethic and self-discipline for deadlines and results. Highly developed skill sets in budget creation and analysis, financial research and analysis, project management, editing, and correspondence. Enter accounts payable including approximately 20-30 invoices, check requests, and complete weekly bank transfers and biweekly payroll bank transfers. Enter payroll changes, check payroll reports and process payroll using the ADP website and prepare the payroll journal entry on a biweekly basis. Handle fiduciary responsibilities for another agency including payroll, accounts payable, Financial reporting, various journal entries, bank deposits and bank reconciliations. Entered accounts payable including a combined total of approximately 100-150 invoices. Check requests, and purchase card charges weekly into the Blackbaud financial edge. Collected cash receipts and handled petty cash disbursements on a backup basis. Completed monthly healthcare, life insurance, workers compensation, and 403(b). Completed life insurance new employee additions and terminations and some health. Prepared bank deposits weekly and entered related journal entries into the general ledger. Summary : Enterprising administrative support professional offering versatile office management skills and proficiency in Microsoft Office programs. Strong planner and problem solver who readily adapts to change, works independently and exceeds expectations. Able to juggle multiple priorities and meet tight deadlines without compromising quality. Skills : Strong PC Including Microsoft Word, Excel, PowerPoint, Dynamics Great Plains, Intuit QuickBooks online pro, ADP. Managed vendor accounts, generated weekly and monthly on-demand cheques. Ensured timely processing of all invoices and credits according to vendor/distribution terms. Researched and solved billing problems and corrected vendor invoicing that had re-established a neglected relationship with vendors and suppliers by ensuring timely and accurate payments for all goods and services received. Maintained up-to-date billing; prepared and processed weekly, monthly, and quarterly billings for all clients. Monitored clients account details to identify and investigate delayed payments and other irregularities. Contacted clients to discuss outstanding invoices and billing issues. Worked with CPA to prepare monthly and quarterly financial statements. Interacted with employees to answer questions and resolve disputes related to the monthly invoices and payroll. 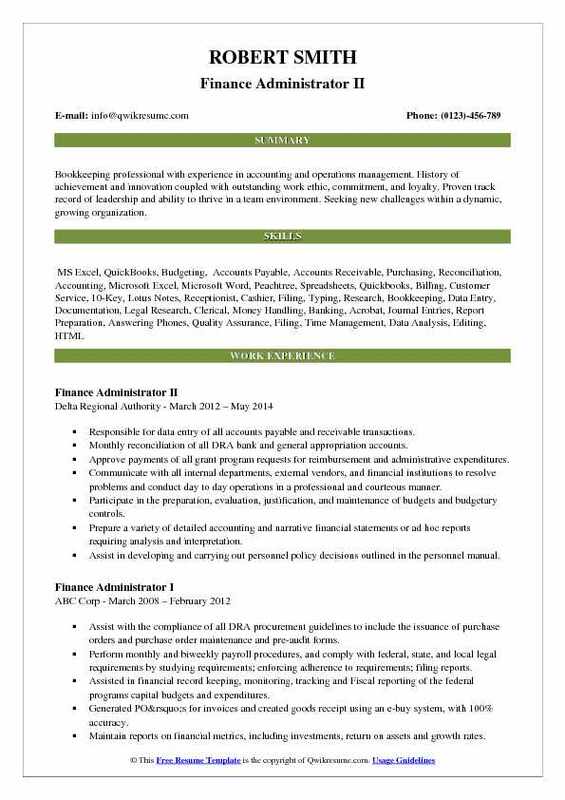 Summary : Results- oriented and multi-faceted professional with extensive experience in Finance and Office Operations. Skilled at developing exceptional client relationships through careful attention to detail, based on practical experience and successful strategies created to improve organizational relationships, cultural alignment and change, and leadership sponsorship. Seeking to integrate a wide range of diverse skills in a new challenging leadership position within a progressive organization. 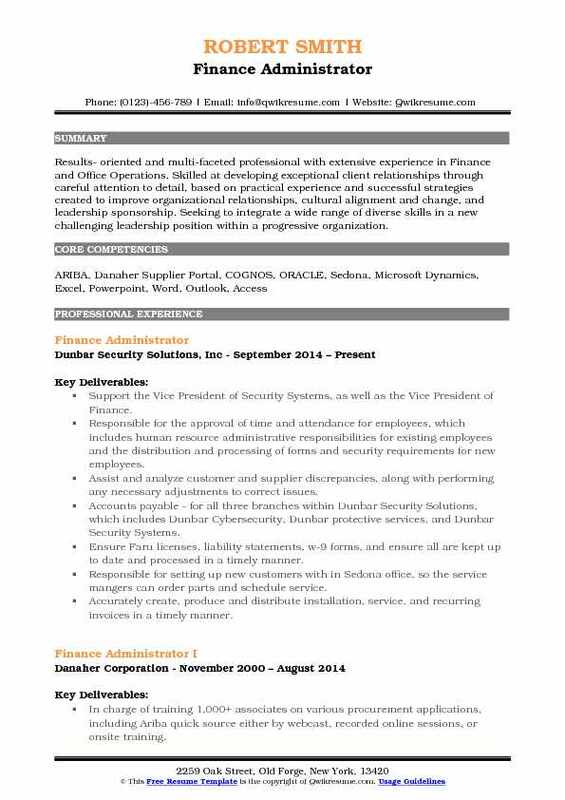 Support the Vice President of Security Systems, as well as the Vice President of Finance. Responsible for the approval of time and attendance for employees, which includes human resource administrative responsibilities for existing employees and the distribution and processing of forms and security requirements for new employees. Assist and analyze customer and supplier discrepancies, along with performing any necessary adjustments to correct issues. Accounts payable - for all three branches within Dunbar Security Solutions, which includes Dunbar Cybersecurity, Dunbar protective services, and Dunbar Security Systems. Ensure Faru licenses, liability statements, w-9 forms, and ensure all are kept up to date and processed in a timely manner. Responsible for setting up new customers with in Sedona office, so the service mangers can order parts and schedule service. Accurately create, produce and distribute installation, service, and recurring invoices in a timely manner. Collect and apply all payments received by check, ACH or credit card. Lock system and generate monthly inventory for the main warehouse as well as the service trucks. Summary : A highly motivated Credit, A/R, A/P, and Collections specialist with over 10 years experience, highly creative, and recognized as a results-oriented and solution-focused individual. Prepare monthly billing for numerous project cases from project inception to closure, all differentiating from created. Gather/coordinate w/ project manager to review job cost in order to not exceed the cap. Research/analyze/compile systems database using created SQL queries and obtain info of projects mailing activity. Review data gathered, timesheet of work done on a project for accuracy and any other expenses used to finalize billing. Prioritize daily workload of project activity to consistently meet the deadline of distribution. Full process of accounts payable, review, code, distribute for approval, enter invoices into the database, contact. Biweekly check runs manually, distribute checks with proper backup for approval, copy, save, file w/ correct. Process/review of expense reports making sure in compliance with companies travel policy. Review corporate card transactions, research and gather receipt documentation for back up and code to correct. Objective : To obtain a position in an exciting organization that allows me to expand on my growing administrative assistant experience. As a hardworking, self-motivated professional, the ideal position would be an excellent starting point to both utilize my current skills and to develop new skills that will lead to my career growth within the company. Supported in delivering profit improvement initiatives, which resulted in $4.5m cost savings. Led successful centralization of AP function by providing full support in transition. Provided complete assistance in GL AR centralization. Managed a team of 6 international staff members in the centralization of accounts payable function, heavy communication on daily basis, provided complete support guidance on emerging ap issues. Streamline the accounts payable function by implementing improved and advanced processes such as manual to auto payments, checks to ACH, paperless invoicing. Train users, prepare training materials, prepare guidelines, assist users and support technical staffs in the implementation of SAP ERP. Responsible for processing weekly payment run ($10m+) in compliance with ey standards and policies. Assist in closing monthly books of accounts, including modules of AR, AP, FA, and GL in line with the deadline as specified by ho on yearly basis in Oracle and SAP ERP systems. Perform bank reconciliations and resolve emerging issues in daily cash clearing process in Oracle ERP. Manage ap inbox and respond to all types of queries on daily basis for 6 town offices 6 airports based in the USA.